For adult learners, fear is the biggest obstacle to learning how to use a computer. ‘Fear is the mind killer’ as Frank Herbert wrote in the Dune novels. Remove this fear and learning how to use interactive technology becomes so much easier, especially as computers have become so user friendly and intuitive. So, teachers, don’t be afraid: interactive flat screen technology was created to make your life easier, not harder. If you have never used an interactive flat screen before and have to learn about them, as your school has just ordered one, here are some ways the interactive flat screen is similar to the traditional white board. The most obvious similarity, when you think about it, is the size and shape of the interactive flat screen and where it is placed in the classroom. It is really not all that revolutionary! The function of the interactive flat screen is to focus the pupils on what needs to be learned. It actually preserves the pedagogic tradition. Through it, the teacher exercises the authority that is traditional to his role. Whiteboard projectors are notorious for being prone to technical difficulties. The interactive flat screen is actually like a throwback to the old blackboards and whiteboards as it is incredibly well made and user friendly, so there are almost never any technical difficulties. It is designed to be as easy to use as a piece of chalk on a blackboard. The interactive flat screen will allow you to teach at your own pace as if you were using a traditional blackboard/whiteboard. Through the interactive technology you have total control over what is being displayed on the screen so you can talk and manipulate the images with ease. And here are some ways the interactive flat screen is different to the traditional blackboard/whiteboard. Whether you are working from your laptop or directly at the screen, you can speed the learning process up as you have instant access to information. This will free you up to spend more time doing other things expected of a teacher such as correcting homework and maintaining a dialogue with individual pupils. Back in the Stone Age learning was more rigid. You copied what was on the board and what the teacher had to say. There was no interaction or engagement. With an interactive flat screen learning becomes more fluid. As you interact with the programme on the screen and as your pupils interact with their iPads, information is no longer fixed but fluid and manipulable. So, teachers, overcome your fears and demons and you will master the interactive flat screen in no time. In fact, you will get so good at it that your pupils will be proud of you! So put the marker away and get your finger ready and remember what they say: the more things change, the more they stay the same. 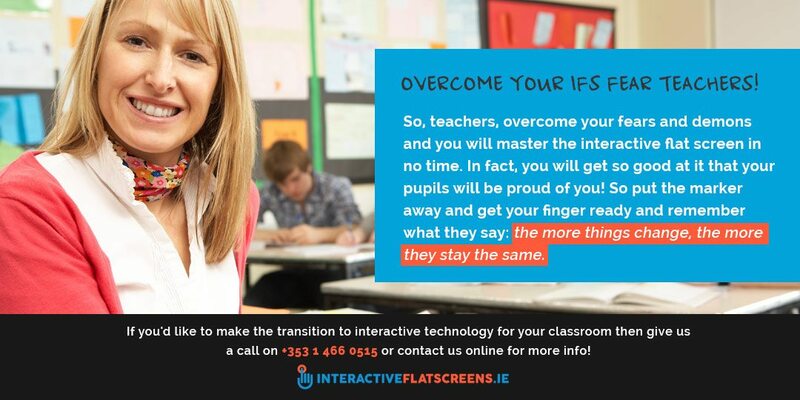 Here at InteractiveFlatScreens.ie we offer the CleverTouch range of interactive flat screens to schools all over Ireland. 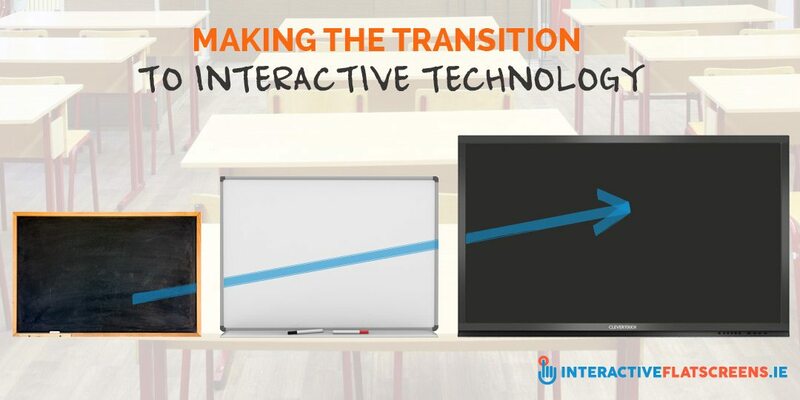 If you’d like to make the transition to interactive technology for your classroom then give us a call on +353 1 466 0515 or contact us online for more info!